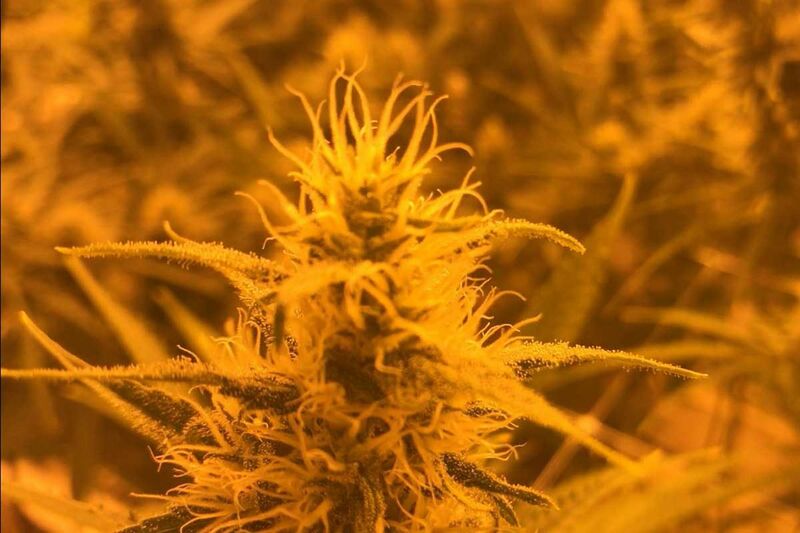 Marijuana grows in a warehouse facility at Garden State Dispensary in Woodbridge, N.J. Arizona-based Harvest is buying the Garden State's parent company CannaPharmacy's operations in New Jersey and Pennsylvania. An Arizona-based cannabis company on Tuesday announced it was acquiring two major medical marijuana licensees in Pennsylvania and New Jersey. Harvest Health & Recreation, which has an extensive footprint on the West Coast, announced early Tuesday that it was rolling up CannaPharmacy in a stock and cash deal. CannaPharmacy operates in Pennsylvania as Franklin Labs LLC and in New Jersey as Garden State Dispensary. Canadian cannabis giant plants a flag in Pennsylvania, plans hemp industrial parks across the U.S. The transaction also includes three CannaPharmacy cultivation and dispensary centers in Delaware and the rights to open another dispensary in Maryland. A spokesperson for Harvest would not divulge the value of the transactions. If approved by state regulators, the deal could make Harvest one of the largest marijuana dealers in the United States, with 213 facilities in 17 states and territories, according to Alex Howe, a spokesperson for the Arizona company. Harvest’s stock (OTC: HRVSF) was down 3.64 percent on the news, closing for the day at $8.82. Franklin Labs, CannaPharmacy’s Pennsylvania operation, is chaired by John Hanger, a former Democratic candidate for governor who once served as an adviser to Gov. Tom Wolf. It was among the first 12 companies to win a permit to grow and process medical marijuana in the Keystone State. After winning its permit in June 2017, Franklin Labs announced its intention to operate inside a former Pepsi warehouse in Reading. But in the two years since then, the company has not shipped a single gram of cannabis. A company spokesperson could not be reached for comment. Franklin Labs caused a kerfuffle in Oct. 2017 when it quietly put its Reading grow permit up for sale — including property and other assets — with a price tag of $20 million. A senior executive explained at the time that the company wanted to pursue an even more lucrative research license that would allow it to produce marijuana in conjunction with a Pennsylvania university — and sell cannabis at five dispensaries. The offer was retracted after the Philadelphia Inquirer reported about the pending sale. The Inquirer was unable to determine Tuesday whether Franklin Labs still intends to pursue one of the eight research licences. Applications are due April 11. The company would have had to surrender its commercial growing permit back to the state if it won a research license. Harvest last year won an unprecedented number of dispensary permits in Pennsylvania by submitting applications under several different names. The gambit paid off. The chain has the ability to open 21 marijuana retail shops in the state which would make it Pennsylvania’s biggest medical marijuana retailer. Harvest opened its first state dispensary in October in Muhlenberg Township near Reading. It has not announced when it plans to open its 20 other stores. In New Jersey, CannaPharmacy has operated Garden State Dispensary since 2013 in Woodbridge, about 20 miles outside of New York City. Garden State Dispensary was one of the original six nonprofits permitted to grow and sell marijuana in that state. Harvest, like several other so-called Big Marijuana companies, has been on an aggressive buying spree. Just last week, Harvest announced it was rolling-up Verano Holdings of Chicago in an all stock deal valued at $850 million to create one of the nation’s biggest cannabis companies. Verano has a dominant presence in Illinois, Maryland, and Nevada. In February, Harvest bought Falcon International Corp. of California for an undisclosed amount. In November, Harvest picked up CBx Enterprises of Colorado for $33.5 million in stock and cash and San Felasco Nurseries Inc. of Florida for $65.7 million in stock and cash.